As crude year 2013 came to a close, the Oilholic found himself in Rotterdam gazing at the Cascade sculpture made by Atelier Van Lieshout, a multidisciplinary contemporary arts and design company. This eight metre high sculpture, in a city that was once the world's busiest port [before Shanghai overtook it in 2004], comprises of 18 stacked oil drums, which give an appearance of having descended from the sky. They combine to form a monumental column from which the life-size drums drip a viscous mass acquiring the shapes of human figures [see left, click to enlarge]. 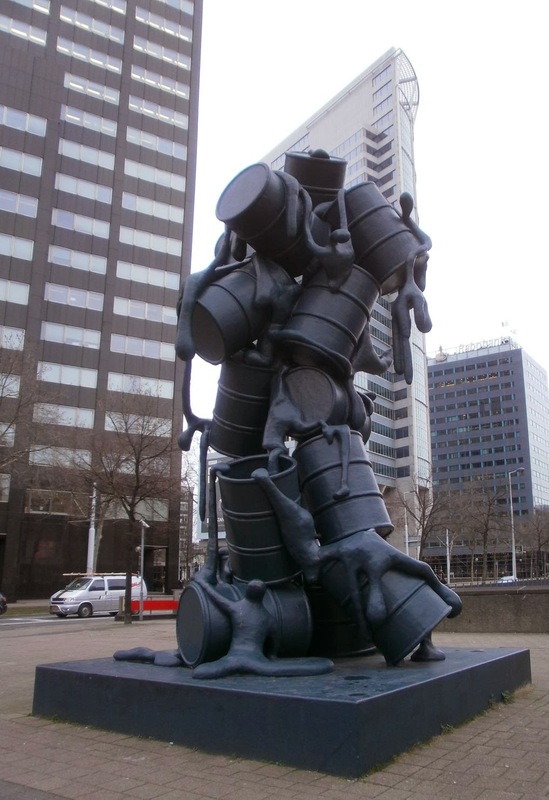 Perhaps these figures and barrels symbolise us and our sticky relationship with the crude oil markets. For all the huffing and puffing, bears and bulls, predictions and forecasts, dips influenced by macroeconomics and spikes triggered by geopolitics – the year-end Brent crude oil price level came in near where it was at the end of 2012; in fact it was 0.3% lower! On the other hand, the WTI reversed its 7 percent annualised reversal recorded at the end of 2012, to finish round about 8 percent higher in year-over-year terms on the last day of trading in 2013. Was there an exact science in the good and bad predictions about price levels we saw last year – nope! Does the Oilholic feel both benchmark prices are running contrary to supply-side dynamics given the current macroeconomic backdrop – yup! Did paper barrels stuff the actual merchants waiting at the end of pipelines to collect their crude cargo – you bet! Watching Bloomberg TV on January 2 brought home the news that money managers raised their net-long positions for WTI by 4.4 percent in the week ended December 24; the fourth consecutive increase and longest streak since July, according to the broadcaster. This side of the pond, money managers followed their friends on the other side and raised net bullish bets on Brent crude to the highest level in 10 weeks, according to ICE Futures Europe. Speculative bets that prices will rise [in futures and options combined], outnumbered short positions by 136,611 lots in the week ended December 31, according to ICE's weekly Commitments of Traders report. The addition of 7,670 contracts, or 6 percent, brought the net-long positions to the highest level since October 22. It seems for some, the only way is up, because the fine line between pragmatic trading and gambling has long gone in actual fact. The Oilholic predicted a Brent price in the range of US$105 to $115 in January last year. As Brent came in flat at year-end, yours truly was on the money. The heart said then, as it does now, even that range – despite being proved correct – was in fact overtly bullish but workable in this barmy paper barrel driven market. For 2014, hoping that some of the supply-side positivity would be factored in to the mindset of traders, the Oilholic's prediction is for a Brent price in the range of $90 to $105 and WTI price range of $85 to $105. Brent's premium to the WTI should in all likelihood come down and average around $5 barrel. The Oilholic's opinion is in sync with some, but also quite contrary to many of the bullish City forecasts. That's for them to maintain – this blogger is quietly confident that more Iraqi and Iranian crude will come on the market at some point over 2014. The US isn't importing as much and incremental barrels will henceforth come on to the markets. These will hopefully trigger a much needed price correction. Of all the price prediction notes in this blogger's Inbox over the first week of 2014, one put out by Steven Wood and Terry Marshall of Moody's appears to be the most pragmatic. Their price assumptions, used for "ratings purposes only rather than as predictions", are for Brent to average $95 per barrel in 2014 and $90 in 2015, compared to $90 per barrel in 2014 and $85 in 2015 for WTI. As both analysts noted: "Oversupply will cool oil prices in 2014." "A drop in Chinese growth and a surge in OPEC production pose the biggest risks to oil prices as we head into the New Year. Prices could fall if Chinese GDP growth slows significantly and OPEC members go above targeted production of 30 million barrels per day (bpd)," they added. Away from crude price predictions on a standalone basis and reflecting on the year that was, the US EIA said prices of energy commodities decreased only modestly or increased last year, while prices of non-energy commodities like wheat and copper generally fell significantly. Natural gas, western coal, electricity and WTI crude prices increased, while Brent, petroleum products and eastern coal prices decreased slightly. "In total, the divergence between price trends for energy and non-energy commodities grew after the summer of 2013. This is in contrast to 2012 when metals prices were stable or experienced slight increases, and a severe drought drove prices of some agricultural commodities higher in the second half of the year," it added. From the EIA to OPEC where both its meetings in lovely Vienna last year, duly attended by the Oilholic, turned out to be predictable affairs with the "official" quota still at 30 million bpd. And we still don't have a long overdue successor to Secretary General Abdalla Salem El-Badri. The Oilholic also managed to grab a moment with Saudi oil minister Ali Al-Naimi at a media scrum in May. Away from the meetings, the year actually began in terrible fashion for OPEC following a terror attack on an Algerian facility, but easing of tensions with Iran towards the end of the year, was a positive development. It was also the year in which the Brits not only got excited about their own shale exploration prospects, but also inked their first contract to import proceeds of the US shale bonanza via Sabine Pass. Analysts liked it, Brits cheered it, but US politicians and energy intensive industries stateside didn't. The Keystone XL pipeline project, stuck in the quagmire of US politics, also dragged on. That yours truly moaned about the banality of market forecasts based on short-termism more than once was not unexpected; a blog on the bankrolling of Thatcherism by the oil and gas sector after the Iron Lady's death in May certainly was. 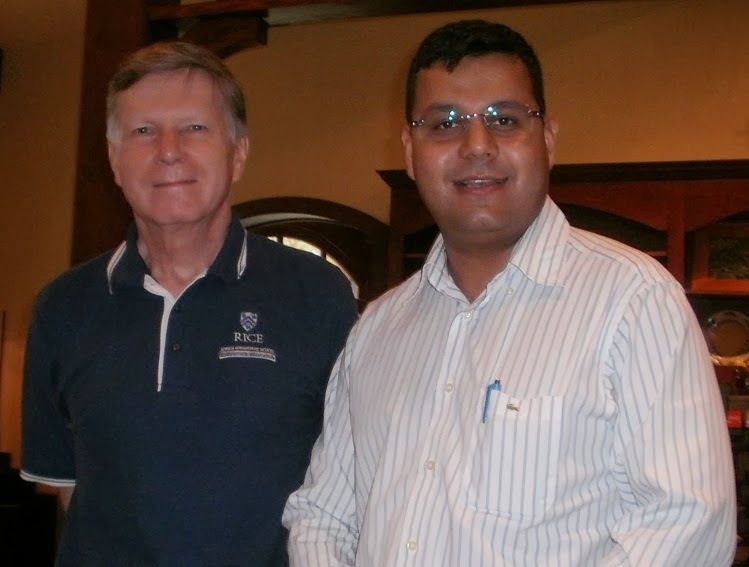 Apart from routine visits to OPEC, ever the intrepid traveller, this blogger blogged from lands far away and some not so far away. 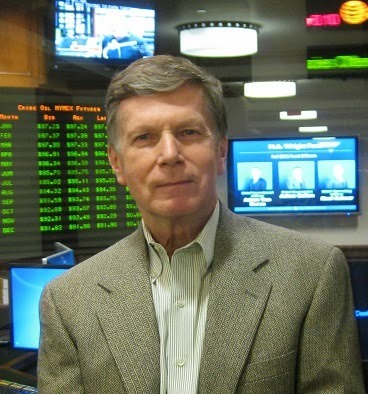 The year began with a memorable visit to the Chicago Board of Trade at the kind invitation of Phil Flynn of Price Futures; a friend and analyst who never sits on the fence in any debate and is most likely to be vindicated as the Brent-WTI spread narrows over 2014. This was followed by a hop across The Lakes to Toronto to gauge opinion on Keystone XL. Jaunts to the G8 2013 Summit in Northern Ireland, crude ol' Norway, Abu Dhabi and a first visit to Muscat and Khasab to profile Oman's oil and gas sector followed thereafter. 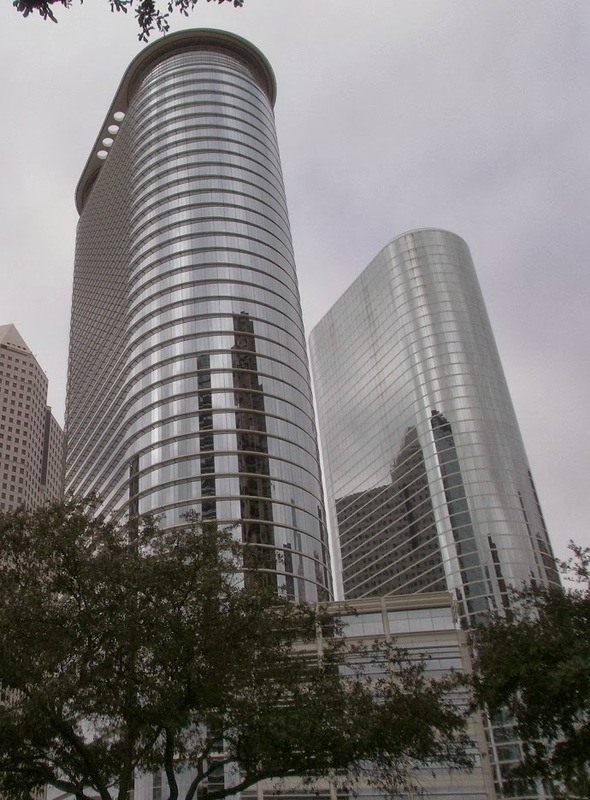 Before calling time on 2013 in Rotterdam, the Oilholic headed out to the Oil Capitals of Europe and North America – chasing the uptick in oilfield services sector activity in Aberdeen, and Platts' response to the Houston Glut in the shape of its new Light Houston Sweet (LHS) benchmark. Moving away from travels, yours truly also reviewed another seven books for your consideration. There goes the look back at Crude Year 2013. As the Oilholic Synonymous Report embarks upon its fifth year on the Worldwide Web and the seventh year of its virtual existence – here's to 2014! That's all for the moment folks! Keep reading, keep it 'crude'! © Gaurav Sharma 2014. Photo: Cascade sculpture by Atelier Van Lieshout Company, Rotterdam, The Netherlands © Gaurav Sharma, January 1, 2014.